The Coal Creek Trail is closed between McCaslin Boulevard and the US 36 Bikeway while improvements are made to the Coal Creek corridor. This includes the ramp from the east side of McCaslin by the RTD stop down to the Coal Creek Trail. Please follow the detour signs from the US 36 Bikeway through Downtown Superior to McCaslin Boulevard. If you have questions, please contact the Superior Public Works & Utilities Department at 303-499-3675. The Coal Creek Trail is a soft-surface trail that parallels Coal Creek from 66th Street in Superior to Erie. The Coal Creek Trail connects with these trails and properties. Aquarius Trailhead has eight car spaces and two school bus spaces. Flagg Park Trailhead has 18 car spaces, an ADA parking space and two horse trailer spaces. South Public Road Trailhead has nine car spaces. Pedestrians, bicyclists, and dogs are allowed on the trails. 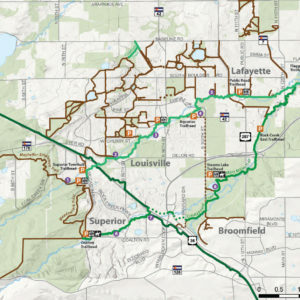 Equestrians are not allowed on a majority of the trails due to city of Lafayette and Louisville regulations. Regional trails and regional trail connectors are open to commuters 24 hours per day. As a riparian (streamside) ecosystem, expect to see many water-loving species.